Fall is one of my favorite times of year. It is the end of the summer vegetables and fruits, and the beginning of fall produce. It is a bountiful time of year. Fall, apples and warm spices inspired these pancakes. It is a comfort breakfast food to the max. 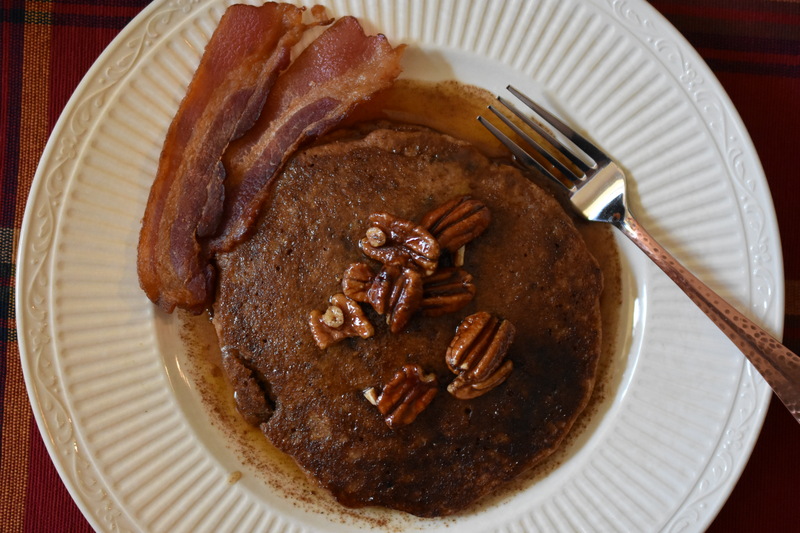 Top the Apple Spice Pancakes with the Quick Butter Pecan Maple Syrup and a side of Oven Bacon and you are fueled for the morning. In a large bowl mix together the dry ingredients: flour, baking soda, salt, cinnamon and vanilla. In a large measuring cup mix: almond milk (1/3c), eggs, butter, honey and vanilla. Pour wet ingredients into dry and whisk until well combined. Add grated apple and stir. Set aside – you will be adding more almond milk just before pouring your batter onto the griddle/skillet. Heat griddle/skillet. The batter will be thick. Add more almond milk until bater is to your desired consistency. Pour batter onto griddle. The pancakes are ready to flip when little bubbles begin to appear. Combine all ingredients in a measuring cup. Stir. Set aside while you are making the pancakes. This lets the pecans soak up the spices and some of the syrup. Microwave for about 30-60 seconds. Spoon over buttered Apple Spice Pancakes. Serve. Eat. Enjoy. Regular whole wheat all purpose flour could be subbed, yes? It should work fine. I use to use it all the time. that has been a couple of years now. Let me know how it turns out. I might not use all whole wheat. Maybe a blend. It can make it a little dense.